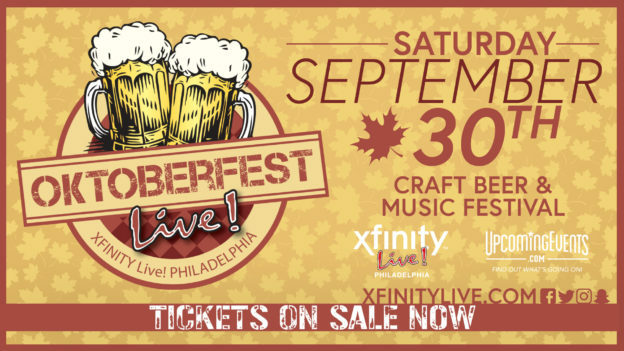 Our Oktoberfest Brew will be featured this Saturday (9/30) at XFINITY LIVE!’s Oktoberfest Celebration! Grab your friends and listen to live bands all day with unlimited samplings of 250+ great beers. Enjoy live music, contests, games, food trucks & much more! VIP and General Admission tickets are on sale! Share and post your pictures using #OktoberfestLive! throughout the day. Voted one of the top-10 Oktoberfest parties in the country by Draft Magazine, we proudly announce the 6th Annual Oktoberfest Live! craft beer festival celebration at the incredible XFINITY Live! Philadelphia. EVEN MORE EVENT AREAS THIS YEAR – massive expanded beer garden & party area and room for over 15,000 people – what does this mean to you? Plenty of space and no long lines on one of the largest Oktoberfest events on the east coast! This festival comes complete with indoor, outdoor, and covered beer gardens, German Oktoberfest-style beer tents, 7 spectacular areas, food trucks, multiple musical acts, and MUCH MORE! Grab some friends and come on out for a beautiful fall day of amazing beer-drinking fun. FULL DETAILS are below under “What can I Expect” – an absolutely amazing line up of beers & fun! Listen to live bands all day with unlimited sampling of 250+ great craft beers from 125+ breweries (yes, many awesome German & Fall / Oktoberfest brews will be included) in your own custom stein while enjoying live music all day long. You’ll also have access to access to Victory Beer Hall and 6 other specialty areas. Entertainment will include live DJs inside, multiple bands including authentic German music, super-fun contests, tons of bartenders & serving spots, games, activities, prizes, and giveaways. PLUS (if you can believe it) MORE! This entry was posted in Featured Event on September 30, 2017 by Edward Poore.